Similar in genetics to kale and spring greens, collard greens have a thick, slightly bitter leaf used in several different cuisines around the world. Like kale, collard greens can be cooked and prepared in a number of different ways to help bring out their flavor. Collard greens are a traditional dish in the southern states that is eaten year round. It's typically prepared with smoked meats, along with seasonings. Wash the collard greens and strip the stems from the leaves and discard. Place the meat in a large pot with three quarts of boiling water and seasoning. Reduce heat to medium and simmer for one hour. Add the collard greens and butter to the water and cook for an additional hour, stirring occasionally. Collard greens can be used in place of other greens, such as kale, in a number of other dishes. While slightly bitter uncooked, the greens take on a richer flavor in the winter months, after the first frost. In addition to preparing them in the southern style, they can be prepared much like other greens. Sauté your collard greens with garlic over high heat to add some depth of flavor. Serve them as a side dish with your favorite meals like chicken fingers or smoked pork crown roast. Wash the greens and strip the stems from the leaves. Heat two tablespoons of vegetable oil in a frying pan until shimmering. Add one to two tablespoons of garlic to the pan and stir until fragrant. Add the greens and continue stirring over high heat until the greens are dark in color, wilted and shrunken in size. Collard greens can be steamed for a quick side dish that retains only the flavor of the greens, without any oils or seasoning. Add them to a healthy seafood meal like broiled finnan haddie. Wash the greens well and strip away the stems. Fill the bottom portion of a vegetable steamer with 2-inches of water and place the basket on top. Add the greens to the steamer and place the lid on tightly. Steam for 10 minutes or until the greens are dark and tender. For a different, more modern way to serve collard greens, consider sautéing and tossing them with some oven roasted vegetables and a little lemon zest. Serve mixed with pasta and topped with Parmesan cheese. You may also wish to add them to some other classic dishes to give them a new twist, like adding them to minestrone soup. They can even be added to a green smoothie for a nutritional boost. Wash and rinse the greens in cold water, rinsing two or three times to remove any grit and pat dry with a paper towel. Strip the stems from the larger leaves, holding the leaf upside down in your hand and pulling the stem down, tearing it out of the center of the leaf. Smaller leaves with tender stems do not need to have their stems removed. Stack several leaves together and slice them lengthwise into smaller pieces to help them cook more quickly. 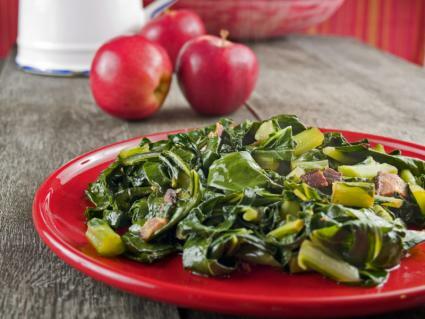 Collard greens have a rich, complex flavor that can add to any number of dishes. Whether you prepare them in the southern style, or you add them to other dishes, they're sure to enhance the flavor of your meal.